Infrastructure as code is the approach to defining computing and network infrastructure through source code that can then be treated just like any software system. Such code can be kept in source control to allow auditability and ReproducibleBuilds, subject to testing practices, and the full discipline of ContinuousDelivery. It's an approach that's been used over the last decade to deal with growing CloudComputing platforms and will become the dominant way to handle computing infrastructure in the next. I grew up in the Iron Age, when releasing a new server application meant finding some physical hardware to run it on, configuring that hardware to support the needs of the application, and deploying that application to the hardware. Getting hold of that hardware was usually expensive, but also long winded, usually a matter of months. But now we live the Cloud Age, where firing up a new server is a matter of seconds, requiring no more than an internet connection and a credit card. This is a dynamic infrastructure where software commands are used to create servers (often virtual machines, but can be installations on bare metal), provision them, and tear them down, all without going anywhere near a screwdriver. Use Definition Files: all configuration is defined in executable configuration definition files, such as shell scripts, Ansible playbooks, Chef recipes, or Puppet manifests. At no time should anyone log into a server and make on-the-fly adjustments. Any such tinkering risks creating SnowflakeServers, and so should only be done while developing the code that acts as the lasting definition. This means that applying an update with the code should be fast. Fortunately computers execute code quickly, allowing them to provision hundreds of servers faster than any human could type. Self-documented systems and processes: rather than instructions in documents for humans to execute with the usual level of human reliability, code is more precise and consistently executed. If necessary, other human readable documentation can be generated from this code. Version all the things: Keep all this code in source control. That way every configuration and every change is recorded for audit and you can make ReproducibleBuilds to help diagnose problems. Continuously test systems and processes: tests allow computers to rapidly find many errors in infrastructure configuration. As with any modern software system, you can set up DeploymentPipelines for your infrastructure code which allows you to practice ContinuousDelivery of infrastructure changes. Small changes rather than batches: the bigger the infrastructure update, the more likely it is to contain an error and the harder it is to detect that error, particularly if several errors interact. Small updates make it easier to find errors and are easier to revert. When changing infrastructure FrequencyReducesDifficulty. Using code to define the server configuration means that there is greater consistency between servers. With manual provisioning different interpretations of imprecise instructions (let alone errors) lead to snowflakes with subtly different configurations, which often leads to tricky faults that are hard to debug. Such difficulties are often made worse by inconsistent monitoring, and again using code ensures that monitoring is consistent too. Most importantly using configuration code makes changes safer, allowing upgrades of applications and system software with less risk. Faults can be found and fixed more quickly and at worst changes can be reverted to the last working configuration. Having your infrastructure defined as version-controlled code aids with compliance and audit. Every change to your configuration can be logged and isn't susceptible to faulty record keeping. All of this increases in importance as you need to handle more servers, making infrastructure as code a necessary capability if you're moving to a serious adoption of microservices. Infrastructure as Code techniques scale effectively to manage large clusters of servers, both in configuring the servers and specifying how they should interact. 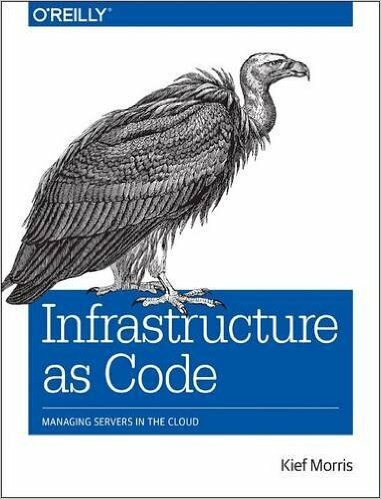 My colleague Kief Morris has spent the last year working on a book that goes into more detail about infrastructure as code, which is currently in the final stages of production. The list of practices is taken directly from this book. This post is based on the writing and many conversations with Kief Morris. Ananthapadmanabhan Ranganathan, Danilo Sato, Ketan Padegaonkar, Piyush Srivastava, Rafael Gomes, Ranjan D Sakalley, Sina Jahangirizadeh, and Srivatsa Katta discussed drafts of this post on our internal mailing list.